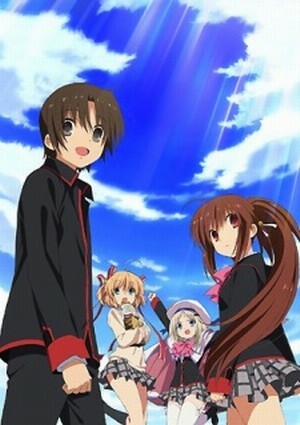 Watch Little Busters! full episodes online English sub. Synopsis: When tragedy struck Riki Naoe as a child, he was rescued from grief over his parents’ deaths when four other kids “recruited” him for their group—the “Little Busters.” Now in high school, Riki and the other Busters are still fast friends, and though their vision of being heroes for justice may have faded, they’d still do anything for each other. Which is why Riki is now on TWO special missions. The not so secret one: recruiting new members so the Busters can form a baseball team. Preferably FEMALE recruits, as the current dude/babe ratio is an inconvenient 4 to 1. The OTHER mission, though… That’s the strange one. Because Riki and Rin, the group’s singular girl, are receiving odd messages, delivered by cats, concerning the existence of a “secret world” and assigning them tasks they have to complete. Were their youthful dreams of being crusaders not so fanciful after all? Or is there something even more vital at stake? Between steeling his courage to talk to girls, dealing with his own narcolepsy and facing his feelings concerning Rin, Riki may just need the strength of a superhero to solve the ultimate mystery of the Little Busters!